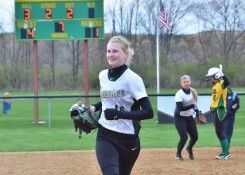 MIDDLEBURY – The Wawasee softball team cleared its first major hurdle of the season Monday night as a 10-game losing skid to Northern Lakes Conference power Northridge was finally snapped. The Lady Warriors saved their best for last in the game, scoring thee times in the sixth and once in the seventh to claim a 4-1 victory over the Lady Raiders. The Lady Warriors fell behind 1-0 in the first inning as Sara Troyer scored on an RBI fielders choice play by Sarah Kane for Northridge. 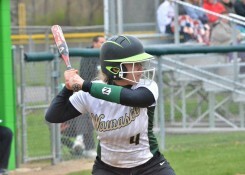 Despite being down just one run, Wawasee never could get the break it needed. The Lady Warriors left runners in scoring position in each of the first five innings, including coming up empty handed with the bases loaded in the fourth. With the poor base running in the fifth that stalled yet another Wawasee scoring threat fresh on his mind, head coach Jared Knipper reminded his team what it was capable of before the top of the sixth inning. “Not much was said, I just told them that I had more expectations from them,” Knipper stated. “I reminded them not to miss out on opportunities. We talk about that all the time, whether that’s in life or softball. We were too complacent, we needed to capitalize on more opportunities up to that point. That message got through to the girls as the Lady Warriors finally started to drive home some runs. Allissa Flores tied the game up 1-1 after being driven home by Meghan Fretz’s double. Fretz came home shortly thereafter along with Kylee Rostochak after a well-hit ball by Ale Brito was dropped in center field. Fretz again drove home Flores for an insurance run the the top of the seventh to help seal the victory. Fretz was 4-4 with the pair of RBIs in the game. 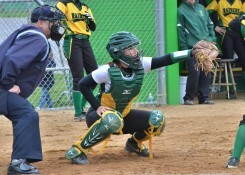 In both the sixth and seventh innings on defense Wawasee responded with poise, going three up, three down in the sixth and allowing just one base runner before closing off the Raiders in the seventh behind a stellar performance from Amber Lemberg in the circle. Lemberg was rattled early by a tight strike zone and the 1-0 deficit, but the sophomore was excellent as she threw a complete game, recording five strikeouts and seven hits throughout. With the win the Lady Warriors remain undefeated in the NLC. The next “marquee” game for Wawasee (9-2, 4-0) will be next Monday (5/4) when the Lady Warriors travel to take on Concord. But that’s far from the player’s mind as there is plenty of work to be done before then with games against Plymouth, Goshen and East Noble all scheduled this week. 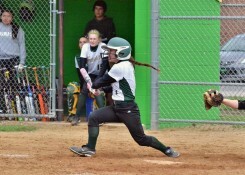 Northridge won the junior varsity contest, 7-6, with a walk-off in the seventh inning. 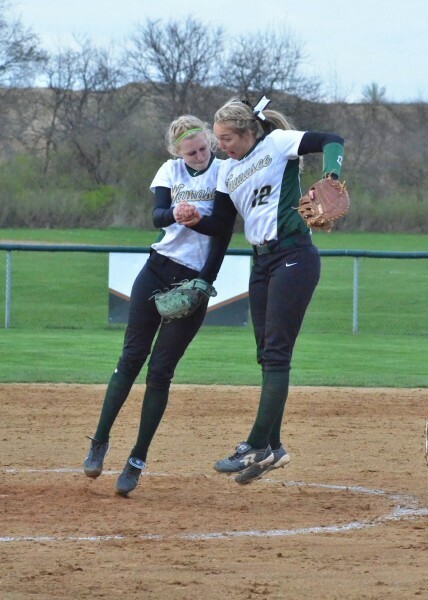 Nicole Streby and Christy Crason each had three hits and combined for four runs and three RBIs for the Wawasee JV. Sarah Kane hits into a fielders choice that would give Northridge its only run of the night. Cristina DeLaFuente had a great birthday as she picked up a hit in Monday’s win. Madi Wilson runs up to catch a poor bunt attempt by Northridge’s Bailey O’Dell. Kylee Rostochak stands in the batters box for the Lady Warriors. 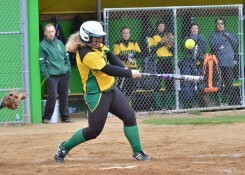 Ale Brito brought home two runs for Wawasee with this swing in the sixth inning. A relieved and jubilant Amber Lemberg trots off the field after striking out a Northridge batter to clinch Wawasee’s first win over the Raiders since 2009.